The breed display at the Maryland Sheep & Wool Festival. 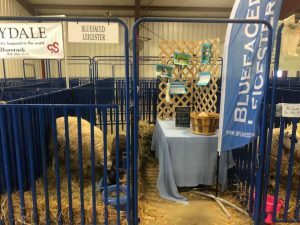 Our thanks to Blueland Farm (MD) for providing the ewe and lamb for the display. The new BFL feather flag is available for BLU members to use in displays at fairs and festivals in your area!